President Obama has doubled down on a go-big-or-go-home approach to deficit reduction. You want $2 trillion in savings? he's telling congressional negotiators. I raise you to $4 trillion. President Obama and leaders on Capitol Hill have committed themselves to moving ahead with a larger deficit reduction deal than negotiators once thought possible in the weeks ahead. In sum, Obama and House Speaker John Boehner (R-OH), along with other GOP and Dem leaders are now aiming for a 10-year goal of $4 trillion in deficit reduction, which would include defined cuts in entitlement, defense, and domestic discretionary spending. The cuts would amount to about 75 percent of the overall savings, and the biggest question now is whether the GOP will truly give ground on taxes -- in specific ways, that produce real revenue. The alternative is that those changes will remain ill-defined in ways that fail to guarantee deficit reduction, and convince already-uneasy Democrats to throw up their hands. (1) It still comes down to taxes. Democrats want more revenue. Republicans won't raise rates. The only place to go is so-called loopholes. The tax code has half as much holes and cheese these days, with $1 trillion in tax exceptions to $2 trillion in real revenue. Most analysts expect we could get $100 billion per year over the next decade in new revenue. (2) This still looks like a great deal for Republicans. Three dollars in spending cuts for every dollar in tax savings is a conservative agreement. Democratic Sen. Kent Conrad's budget blueprint has a one-to-one ratio. The liberal Center for American Progress has more tax hikes than spending cuts. The Republican party can't walk away from a deal that cuts spending by $3 trillion in ten years, can it? (3) I'm ready to say I was wrong about the debt ceiling. If we get a deficit reduction deal in a month, the debt ceiling will have done what no gang, commission, beer summit, Ideas Festival or Brookings panel discussion could. It will have brought the deciders to the table to actually decide on a deficit reduction plan. I still reserve the right to hate the final plan, think it goes too far on domestic cuts and not far enough on taxes. But a $4 trillion deficit reduction deal would be a historic accomplishment for any Congress, especially one that had ostensibly given up on governing. Update: Two provocative charts from Nate Silver help to explain why Republicans are having trouble getting to yes, even though this is starting to look like a great deal for the GOP. He calls the pictures "one of the more important ones that we've presented at FiveThirtyEight." 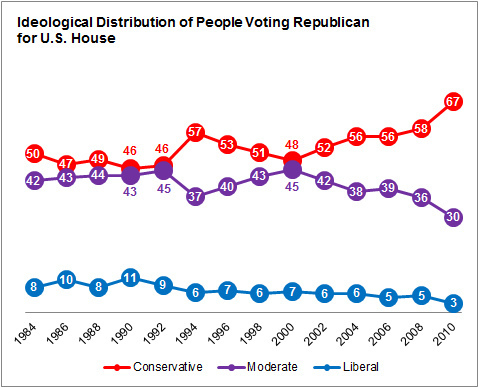 The first graph tracks the ideological breakdown of the House GOP voters. They're getting much more conservative. The second shows the same for Democrats. They're getting more liberal, but they're still fundamentally moderate. To be sure, "conservative," "moderate" and "liberal" are not hard and permanent measurements. They're indicators whose definition changes over time. 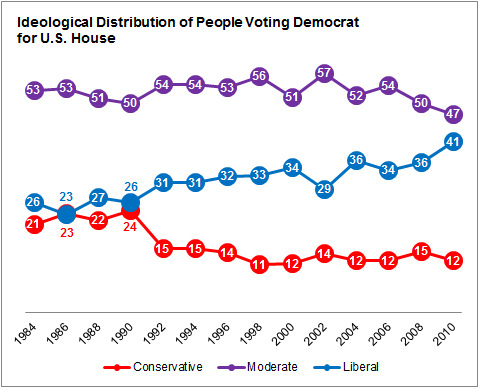 But I think Silver's bottom line is right: "The Democratic Party is intrinsically more pluralistic than the G.O.P. -- a characteristic that may be disadvantageous when it comes to governing, but can give the party an edge in elections." There's a cut-and-paste-and-frame sentence if I've ever heard one.